In a move that puzzled and outraged Russia's Jewish community, a U.S. court has ordered Russia to pay a fine of $50,000 a day to a U.S. organization as long as a collection of thousands of old Judaic books and documents remains in Russia. The U.S. district court in Washington, D.C. on Jan. 16 ordered Russia to pay a fine of $50,000 per day to the U.S.-based Chabad-Lubavitch organization as long as the Schneerson Library, a collection of thousands of old Judaic books and documents, remains in Russia. The ruling upholds a 2010 court order. The Schneerson Library is a collection of old Jewish books and manuscripts built by Rabbi Yosef Yitzhak Schneerson in the Russian Empire at the end of the 19th century. Part of the collection was nationalized by Bolsheviks in 1918 and eventually joined the Russian State Library collection. Schneerson managed to take the other part of the collection out of the Soviet Union while emigrating in the 1930s. About 25,000 pages of manuscripts from the collection were later seized by the Nazis, then were regained by the Red Army and handed over to the Russian State Military Archive. Chabad-Lubavitch has been seeking the Schneerson collection's handover since the end of the 1980s. The D.C. district court judge handed down the ruling despite the fact that the U.S. Justice Department urged him not to. According to the Wall Street Journal, "The department argued that fines won't help resolve the dispute, would be counterproductive, and would hurt U.S. foreign policy interests." Based on the earlier ruling in favor of Chabad-Lubavitch, an attempt was made in 2011 to seize a collection of Russian icons being exhibited in the U.S. As a result, the Russian government suspended the organization of exhibitions in the U.S. The new ruling has further outraged the Russian authorities. The Russian Foreign Ministry responded then that the ruling was unlawful, as the collection "never left Russian territory and was nationalized, since the Schneerson family did not have legal inheritors. Therefore, the 'return' of these books to the U.S. is impossible in principle." Moreover, it insisted that it is "the U.S. Hasidim who are supposed to return seven books from this collection to Russia, which were lent to them from the Russian State Library for two months in 1993 through the Library of Congress under the international interlibrary exchange system and have been unlawfully held for 16 years now." "It is outrageous that a Washington court has taken this unprecedented step fraught with most serious consequences as the imposition of a fine on a sovereign state," the Russian Foreign Ministry said in a statement on Jan. 17. "We have stated repeatedly that this ruling is exterritorial in nature, goes against international law and is legally null and void. The Schneerson Collection was historically built on our country's territory, is the national heritage of all Russian people, and, as state property of the Russian Federation, enjoys jurisdictional immunity," the ministry added. The Russian Foreign Ministry has warned the U.S. that it may take retaliatory measures if Russian government property is seized in the U.S. to enforce the court ruling. We hope the American authorities understand that, if Russian government property not protected by diplomatic immunity is seized in the U.S., which Chabad is demanding as an enforcing measure, we will have to take tough retaliatory measures," the Russian Foreign Ministry said. "The Schneerson Library is part of Russia's entire library collection and therefore cannot be handed over to private individuals in the U.S., just as it cannot be handed over to anyone outside our country," Deputy Culture Minister Grigory Ivliyev told Interfax on Thursday. "This court ruling agrees with the entire political situation. This ruling should be viewed considering the entire spectrum of relations between Russia and the U.S., especially in the culture field." The Russian Culture Ministry will not step back from its position, he added. "We are acting in line with the law, and our position is unchanging," the Russian Deputy Culture Minister said. "We are not going to step back from it. He insisted that the collection is being maintained in good condition and also emphasized that there are no restrictions for U.S. citizens' access to these documents. "These manuscripts are stored in the manner that documents of this kind are supposed to be stored. All the necessary storage conditions have been provided," Ivliyev said. "We do not restrict U.S. citizens' access to these documents in any way, but we proceed primarily from interests of our citizens, who are entitled to familiarize themselves with such important and rare documents," he said. 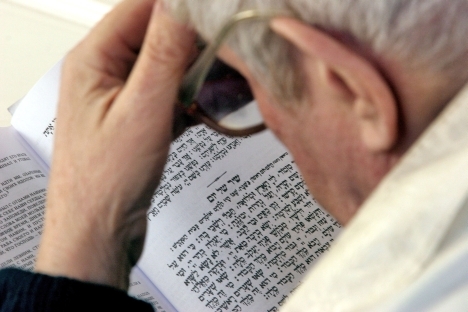 Meanwhile, the Federation of Jewish Communities of Russia (FJCR) is skeptical and critical about a U.S.-based Jewish organization's attempts to gain possession of the Schneerson Library through court rulings. "This sluggish litigation, which has been lasting for many years, looks more like a PR stunt than a real judicial proceeding," FJCR spokesman Borukh Gorin told Interfax. "[The latest ruling by the U.S. court] is just as implementable as the previous ones: the U.S. court will succeed in recovering the money just as it succeeded in recovering the library." Gorin doubts that "this court saga" can have any prospects. "It is obvious to any observer that Russia is not hurrying to comply with a U.S. court ruling and will never do so. Any more of such rulings would only provide Russia with another opportunity to reaffirm its resolve not to comply with a U.S. court order," he said suggesting that a compromise should be reached somehow, although "it is difficult to say what exactly a compromise could be here, as there are a lot of middle grounds here, and various middle grounds were proposed on this way." When asked whether he believes the Schneerson Library should remain in Russia, Gorin said the issue has a moral and a legal aspect. "As for the legal aspect, this question is not for me," he said. "As for the moral one, I am sure that things seized for this or that reason from their rightful owners should be returned. These books were seized in an unlawful way - they were pledged for storage and never returned." Meanwhile, Russian presidential representative for international cultural cooperation Mikhail Shvydkoi is perplexed by a U.S. court order on the so-called Schneerson collection, as he thought Russia and the United States had earlier settled the problem. "Russia earlier honored all agreements on this issue. The problem was discussed within the Gore-Chernomyrdin commission's framework, and we reached quite a reasonable compromise with the American side then," Shvydkoi told Interfax. "We set up the Center of Oriental Literature at the Russian State Library, where, in particular, the Schneerson collection is stored, and it is accessible to any citizens, including Russian and others. A prayer room was also set up there, where religious cults can be observed," he said. "I had assumed the issue was settled." Russia is not going to break its own laws to comply with U.S. court rulings, Shvydkoi added. "Transferring books from the Russian State Library violates the law, it is prohibited," he said. Shvydkoi describes the U.S. court ruling as "unfriendly and upsetting," which will harm not only Russia but also the United States. "The result that we have now following years of attempts to reach a reasonable compromise is certainly bad for us, too, but it is bad primarily for the U.S. We have already suspended loans of any museum valuables that were to be exhibited in the U.S., and now we will have to give a similar response," he said. Shvydkoi called the U.S. court's ruling encroachment on Russia's sovereignty. "Such a decision made in relation to a sovereign state encroaches on its sovereignty. The Justice Department and the State Department should understand the consequences of such steps, but the executive branch has distanced itself from this problem, citing the strict separation of powers and inappropriateness of pressure on a court," Shvydkoi said.